It's Valentine's Day soon, everybody! Here's a little something spicy to ring in the holiday. Michael and I shot these little beauties for 425 Magazine, and I also show you how on King 5's NEW DAY NORTHWEST, which you can watch here! I walked out to my car around midnight, after the ovens were scrubbed, and my feet just ached. I hit my keys to unlock the car, with real tears in my eyes from feeling unloved. My dome light came on, and through the dark I could see something inside my car. I couldn't quite make it out, but I got nervous as I took a few steps forward. I could see flowers. A huge sense of relief washed over me as I opened the driver’s-side door to find dozens of roses and my very first enamel-covered Dutch oven. It was bright-red and pink, and ivory roses were everywhere. A card on top said thank you. Imagine that: a thank-you card on Valentine's Day, for me, the grumpy brat who didn't always get things her way. I thought I had wanted a silly box of chocolates when I woke up; instead, my dreams came true that evening. I just had to wait a bit longer. Sometimes, waiting is exactly what we need. What are you waiting for these days? What are you hoping for? I want to encourage you that God knows all those desires and dreams in your heart. They will come to pass in His time. I promise that, no matter how long it takes, you will get there. I am happy to say I’ve done some growing in the last few years, and my desires sure aren’t what they used to be. I used to long for money and success. I can’t say it enough now: God has shown me that true success is won in the heart. It’s not about the things you amass, but more about the way you love and how much you give away. My hope is that this book becomes a picture of love and giving, and a motivator to be with people. Know that the legacy you leave on this Earth can be far sweeter than a posh career. To love your family well is the greatest treasure out there -- to sit a spell and enjoy others’ company. Don’t let your eyes fill with tears over the worldly things you don’t possess; let your heart fill with joy over what you have. I will forever be grateful for my tiny kitchen, with poor lighting and a coil-top range that isn’t the prettiest. It’s not what you have that’s special; it’s how you use it. In every book I write, I will close with this: I hope the recipes living in these pages become your own. I hope they feed your soul and nourish your heart. I hope the binding breaks, and you scribble in your changes. My hope is that this book brings life for generations to come." Pre-heat your oven to 350 degrees. Use a nonstick cooking spray to grease your donut pan. This step is crucial; buttering and flouring the pan won’t yield consistent results. To make the doughnuts, mix all dry ingredients into the wet. Gently fold until it just comes together. Spoon the batter into the doughnut pan and bake for 8-12 minutes until doughnuts are puffed and a pick inserted into the cake comes out clean. To make the ganache, pour hot cream into the chocolate and cayenne. Mix until smooth. Add vanilla and salt. 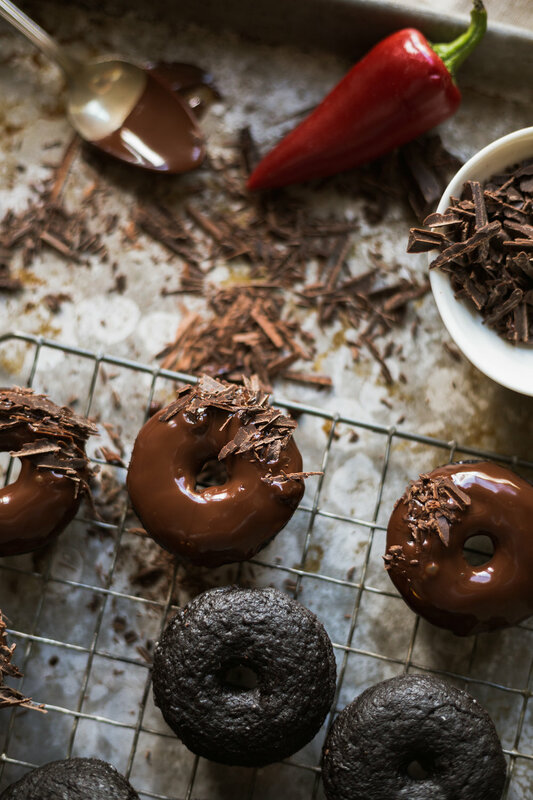 Dunk or drizzle over your cooled mini doughnuts.